At the Pavilion Kuala Lumpur mall in Malaysia is a Christmas tree. It towers 75 feet over holiday shoppers. But its height isn't the most interesting thing about it. Nor is the fact that it's the first of its kind at the mall. Rather, the secret is in its sparkles. It's made of 175,000 glittering Swarovski crystals. These are separated into 3,100 six-and-a-half-foot strands and valued at about $700,000. A nightly snowstorm at the mall's winter garden entrance adds to the luxurious holiday ambience. Malls in Asia are increasingly becoming mega-destinations. They include movie theaters, banks, restaurants, bars, bowling alleys, zoos and more. In Malaysia alone, shopping centers encompass 100 million square feet and about $33 billion in real estate value. Eight of the world's top 10 malls are in Asia. So it's a logical place to get into the holiday spirit in extravagant style. The displays are spectacular indeed. One mall in Tokyo had a Godzilla-shaped tree. It breathes smoke. A glittery display of trees and landscape lighting is out front. 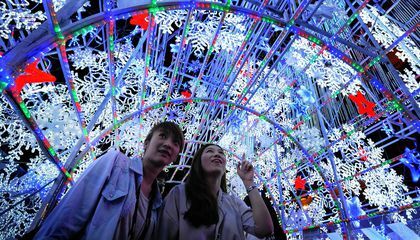 In recent years, Christmas mall displays in Hong Kong (for a century, a British colony) have included everything from two-story-tall polar bears to a Central Park-inspired indoor park. The latter included light-up bicycles and an entire Christmas town. It even had an Andy Warhol-themed display of soup cans. Shoppers in Malaysia have enjoyed a Christmas bazaar under a giant holiday dinner table. In addition, there have been gigantic hot air balloons, a sparkling indoor forest, a candy village, giant Lego displays, and a fairy-themed indoor town. In China, developers are even building a replica of Finland's famed SantaPark. This obsession with Christmas decorating may also be partially related to the absorption of some aspects of American culture. Robert Foyle Huwick of The Atlantic writes that about 275,000 Chinese students participate in study abroad programs in the United States each year. They bring American Christmas traditions back with them. Those traditions combat solemn, serious traditional fetes with opportunities to party and shop. Expat culture also makes the holiday look pretty appealing. It is especially true in places like Hong Kong. It is home to over 300,000 expatriates. The holiday is celebrated across the region without religious context. Instead, it's an excuse for friends and family to get together and have a good time. Given the grandeur of the continent's many Christmas celebrations - and the widely reported death of the traditional American shopping mall - there's perhaps never been a better time to head to an east Asian shopping mall. 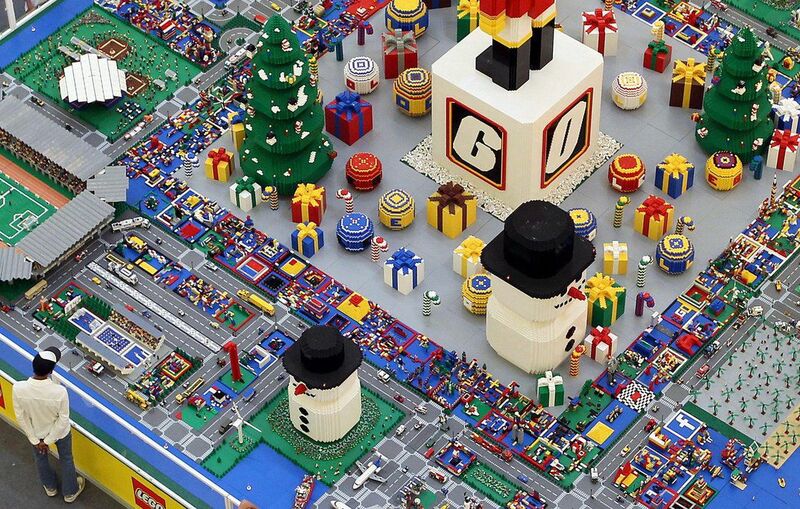 Visitors can receive a dose of outrageous good cheer. Malls in Asia create fantastic and beautiful displays for Christmas. One tree has 175,000 crystals. People want to shop with Christmas fever, celebrate traditions, get together with family and friends. This is a beautiful! These are the best decorations I've ever seen! The Christmas tree concept is all over the world. I love these displays, especially when they are all lit up and creative. People come here and study to take back ideas about Christmas. It is so easy because a lot of people want them. It is lower than 3,100six-and-a-half-foot and most of the trees are smaller than 3,100. Most of the trees want to be in a house.It is home to over 300,000 expatriates. Most of the world's top 10 malls are in Asia so that’s where most of the trees are. Personally, I love Christmas just because I love going around or driving down the road seeing the houses all lit up. Its a beautiful time of the year these displays are stunning. This is awesome! I love looking at Christmas displays. Going to a mall and seeing more than just the usual Santa set up would be more interesting. The reason is because the Christmas tree concept is all over the world. I love these dis plays, especially when they are all lit up and there on that display shining so bright. It all just so pretty. The Christmas tree concept is all over the world. Especially when they are all lit up and creative.